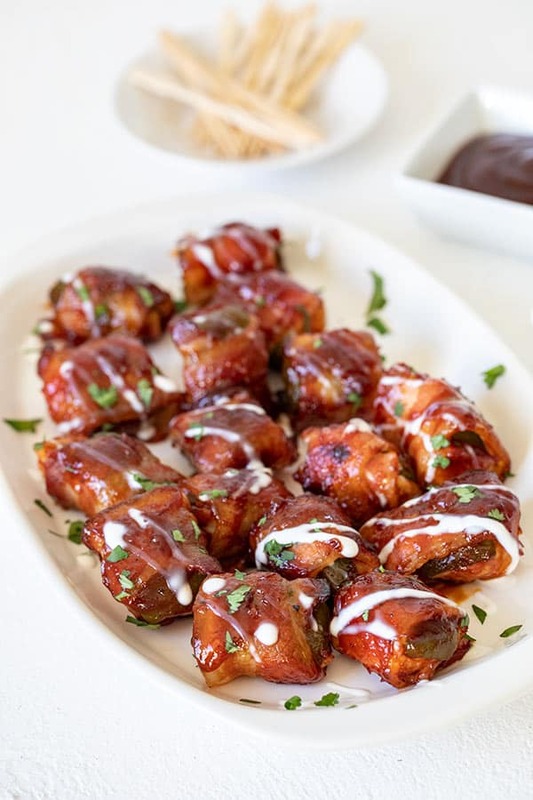 Spicy jalepeno pieces filled with tender chicken wrapped in smokey bacon and covered in a spiced up barbecue sauce, then baked until the bacon is crisp and the sauce is caramelized and sticky. 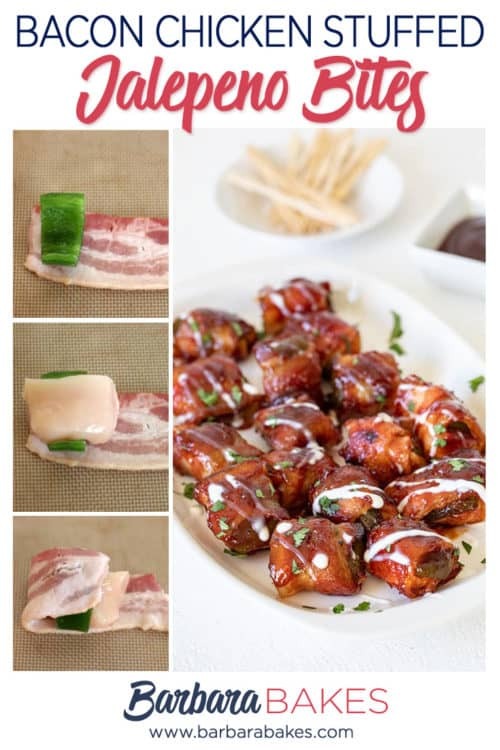 These Bacon Wrapped Chicken Stuffed Jalapeno Bites are the perfect appetizer for almost any occasion. They’d be great for the the bowl games, as part of a Weekend Ski Party, or on a cruise ship in the middle of the Caribbean. Also included in this post is a Recipe Round Up. I’ve joined a fun group of bloggers to put together a roundup of recipes on the first day of every month. 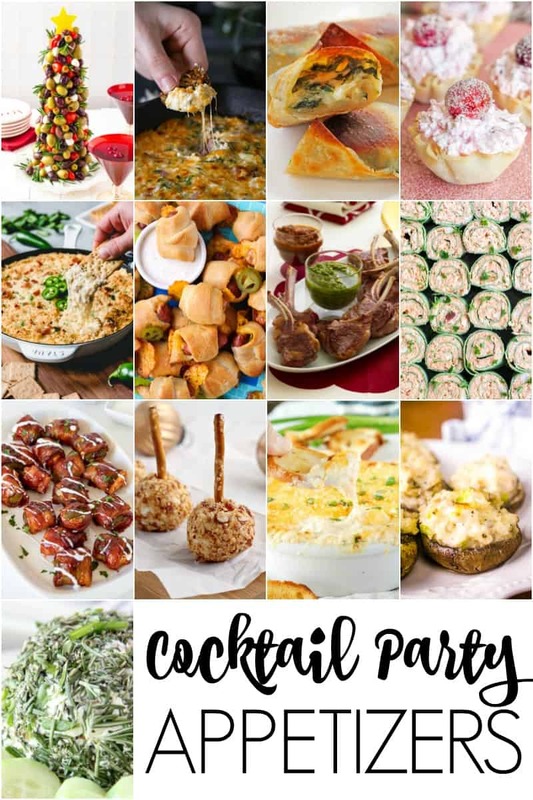 This month we’re sharing Cocktail Party Appetizers. I posted a recap of my Click Blogger Retreat abroad the Oasis of the Seas and the wonderful meal we were treated to at the Sabor Mexican restaurant on the ship. For an appetizer I ordered the Bacon Wrapped Chicken Stuffed Jalapeno Bites and shared them with those sitting near me. Hayley, The Domestic Rebel, and I loved them so much we ordered more. I couldn’t resist recreating this sweet, spicy appetizer when I got home. 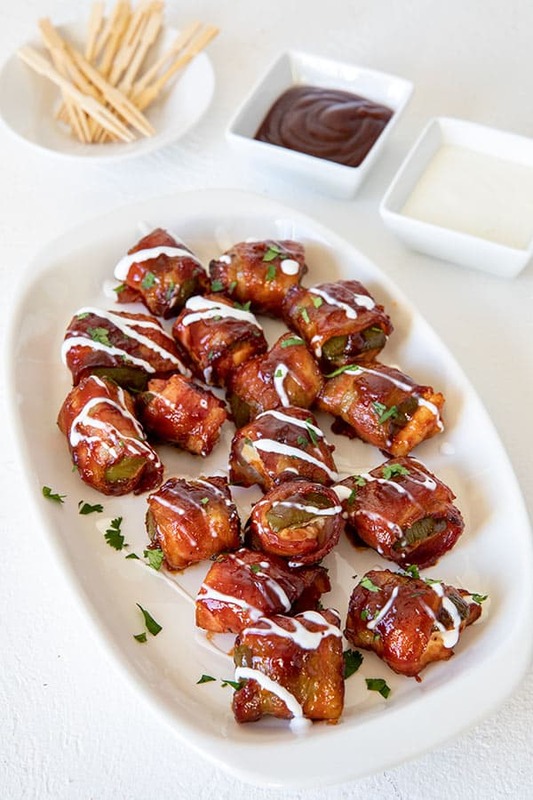 They’re an easy appetizer to make; all you do is wrap jalapeños and chicken breast pieces with a half slice of bacon, then coat it in a spiced up barbecue sauce and bake them until the bacon’s crisp and the barbecue sauce is sticky. I’ve made these bites twice since I got home from the cruise. The first time, when I took the pictures, I secured the bites with toothpicks before baking. The second time I didn’t use a toothpick to hold them together and they were easier to make and easier to baste, so I’ve omitted the toothpicks from the recipe. You can just add a toothpick after they’re finished baking to make them easier to eat. The jalapeno bites on the ship were super spicy, almost too spicy, so I toned down the spiciness in my sauce a little bit. But if you like it really spicy, just add more Tabasco to your barbecue sauce. I used my favorite barbecue sauce, Masterpiece original. The recipe makes 16 bites, but if you’ve making them for a party, I’d suggest doubling the recipe. Enjoy! Preheat oven to 400°. Line a baking sheet with foil or a silicone baking mat. Cut the jalapenos in half lengthwise; remove the stem and seeds. Cut each jalapeno half in to 4 pieces, so you have 16 pieces total. 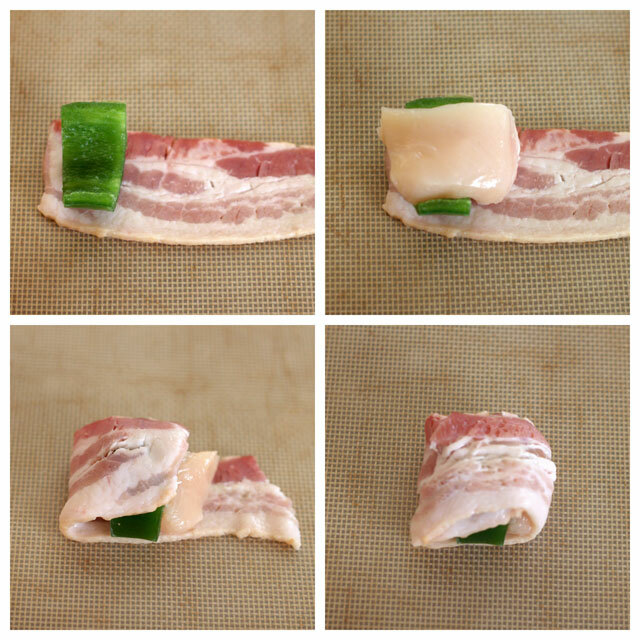 Place a piece of jalapeno on a piece of bacon. Top with a piece of chicken; wrap bacon around the chicken and jalapeno. Place seam side up on the prepared baking tray. Baste the top and sides of the bite with BBQ sauce. Bake for 15 minutes. 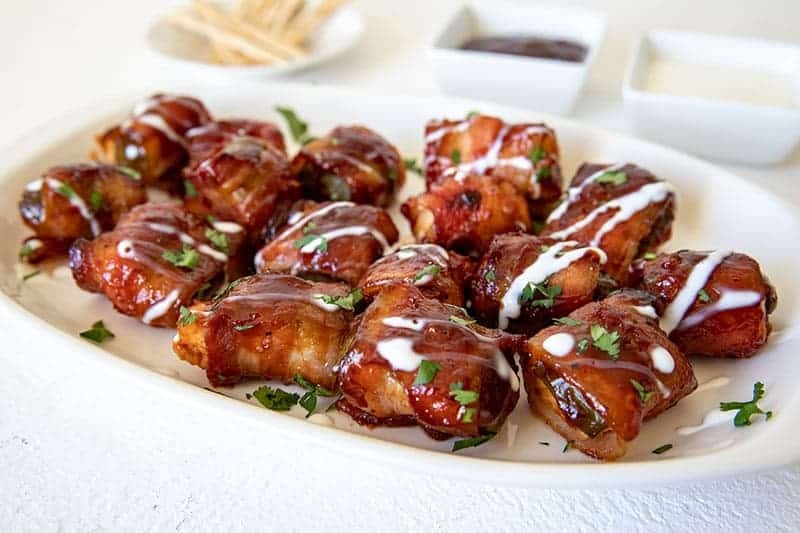 Remove bites from the oven and flip the bites over; baste with remaining BBQ sauce. Return to the oven and bake another 10 to 15 minutes until the bacon is crispy and the chicken is cooked through. Serve with chopped cilantro and a drizzle of Mexican Crema, Serve additional Crema on the side for dipping if desired. These cuties look amazing Barb! We have to try them for our next gathering, always could use something spicy at the party,.. thanks for the recipe! PS Your photos are gorgeous! I’m pretty sure I couldn’t stop at one! Umm yes please!!!! Making this tonight. How fun! I could have eaten it for a meal too. Enjoy! WOW these sound amazing! And, these bites would be Perfect for anytime…- not just for the Super Bowl. Sounds like you had so much fun on that ship! Great recipe! Wow…these sound amazing Barbara; I seriously love everything about them. Thanks for sharing a part of your trip with us! Perfect for a superbowl party! They look so yummy!